Posted in PicsNo, Twitter, Uncategorized. The library responsive design (RWD) websites presented here are the library sites from my the previous article listing higher education and library RWD sites. 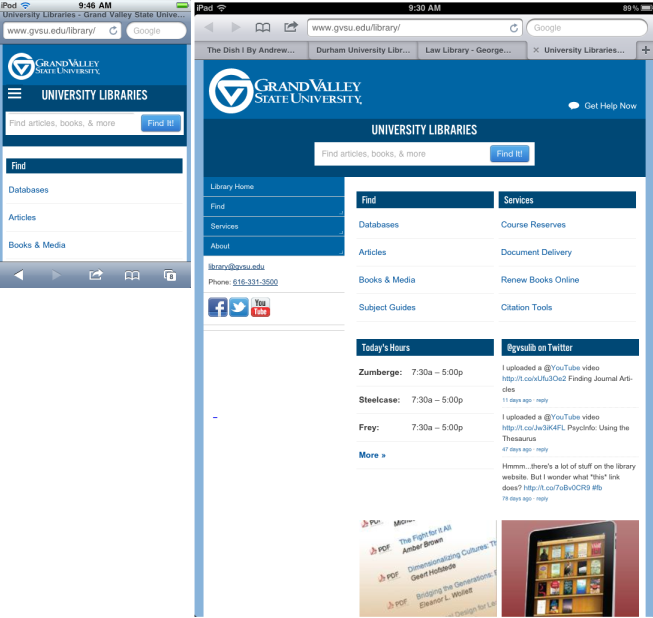 The screenshots (from iPhone/iPod-Touch & iPad) give an idea of how website content changes with a small screen size. You can see the same thing on a larger screen by going to the site and changing the window size to see how the page responds. 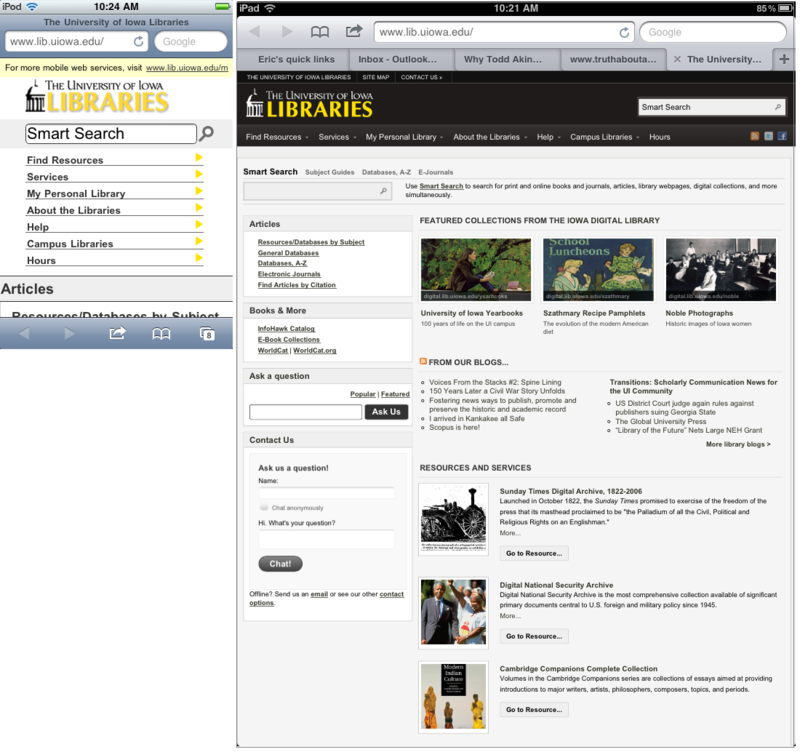 Click the library name to go the library site; click the screenshot to see it in larger size. 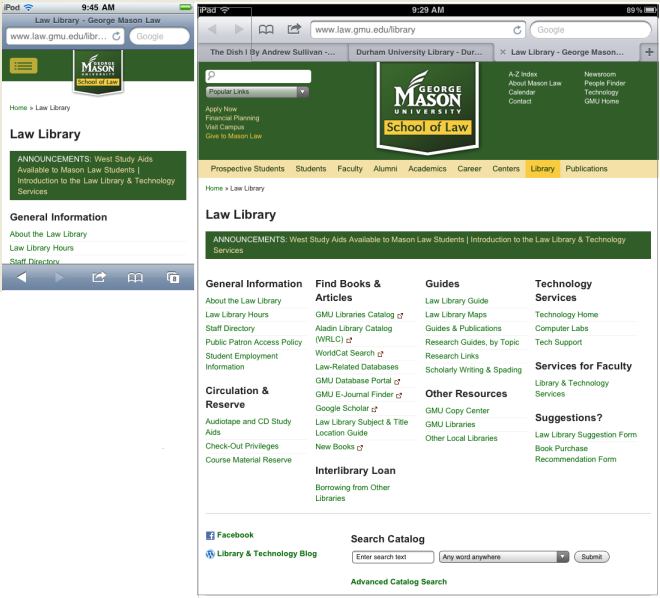 The two library sites below are strongly integrated with their institutional websites, and the first screen on the iPhone is completely taken up by institutional information. So for the iPhone screenshot, I’ve added the second screen, that has library information. Posted in iPad, iPhone/iPod Touch, Libraries, PicsYes, Responsive Design, Uncategorized. Unfortunately, Flipboard does not provide a space to work with the tweet text and the article title together. So I combine the “Reteet with Comment” button with the “Email Link” button to send the text of both to my email, and compose a retweet from there. I’ve made a set of Flickr slides that show this process. It might look complicated, but with the smooth iPad multitouch interface, the process only takes 15-20 seconds. The illustration below is a brief composite of the slides showing the process. To see all slides, click the illustration below, or go here. Posted in Flipboard, PicsYes, Twitter, Uncategorized. Since Twitter launched the Official Twitter Retweet (OTRT) in 2009, there has been much talk of its pros and many cons. I won’t go into all of the issues involved here. Instead, I’ll discuss a couple of the problems of the OTRT that I think are often not considered, but have important implications for all Twitter users. The first is that OTRT’s do not appear in Twitter Search. This is easy to see, by doing what I’ve done in the accompanying screenshots – Find a tweet in your timeline that’s been retweeted using the official Twitter retweet, as indicated by the gray arrow icon, as in the screenshot. Then do a Twitter search for some words in the tweet. 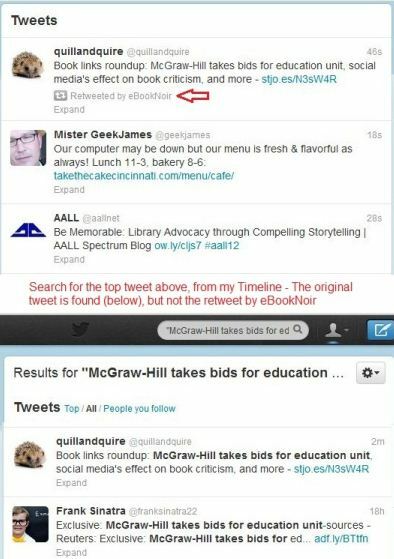 As shown in the lower screenshot here, the original tweet is retrieved by the search, but eBookNoir’s retweet, in the example, is not. The fact that OTRT’s do not show up in Twitter searches has particularly timely implications, because of the new feature that Twitter just launched, the ability to search people you follow. If you follow a lot of people with a wide variety of interests, this is invaluable because it makes it easy to find out which ones are tweeting on a specific subject. But unfortunately, if people retweet with the OTRT, they won’t show up in the search. In addition to Twitter Search not including OTRT’s, Twitter Lists also don’t show them. Twitter Lists are an excellent way to keep track of people tweeting on a particular subject. They have become especially popular and useful in the Flipboard app, so it’s unfortunate that OTRT’s are not shown in Twitter lists. So, OTRT’s are not found in Twitter searches or Twitter lists. Where can they be found? – On your Twitter home page timeline (of your followers’ tweets) and in the tweets of individual people that you follow. Also, interestingly, in Topsy – Oddly, this third-party Twitter search tool includes OTRT’s in its searches, even though Twitter itself does not. The basic reason that OTRT’s don’t show up in Twitter Searches or Lists is that they actually are not considered individual tweets, and consequently do not have a separate page. In a sense, they’re considered to be more of a “favorite” than a true retweet. So be aware – If you want your tweets to be in the Library of Congress’s archive of tweets, avoid using the Official Twitter Retweet! Posted in Flipboard, PicsYes, Twitter, Twitter Tips, Uncategorized. Posted in PicsNo, Responsive Design, Uncategorized. An interesting New York Times story with a weak headline gave me a great opportunity recently to use my Twitter skills to tell the world about the story. In addition, the way my tweet was retweeted is a good secondary story, being an example of balancing Twitter retweet-etiquette with other priorities. The screenshot at left shows a “what’s wrong with this headline” view of the story. The headline, as I’ve indicated with my highlighting, misses many of the important points of interest in the article, in my view. The biggest problem with the headline is the dull, overused term “big data.” Apparently this is used to indicate the “12 million” items that are mentioned in the lead paragraph. 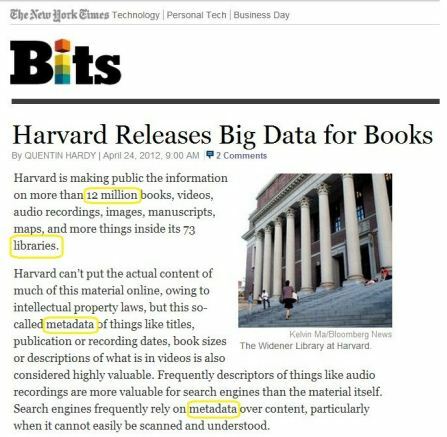 But the “big data” concept has been used so broadly that “big data for books” could mean many things, from full-text to circulation. So I say mention the eye-catching “12 million” in the headline. Finally, the word “metadata,” which is used prominently in the story. Again, maybe it’s my librarian-centric view, but I think the term has become important for many people outside the library world, and would merit inclusion in the headline. It’s clear that he got his tweet from mine, from the wording, which was original with me, and because he used the same bitly URL that I used. Usually his retweets follow the usual retweeting protocol of mentioning my Twitter name. But in this case he didn’t, because he wouldn’t have had room to include that and also the “pretty cool” comment he added at the head of the tweet. He no-doubt judged that adding his endorsement would draw attention to the tweet, and make people click it and retweet it, which is FINE WITH ME! The wider lesson here is that much of the skill of using Twitter is thinking about priorities. 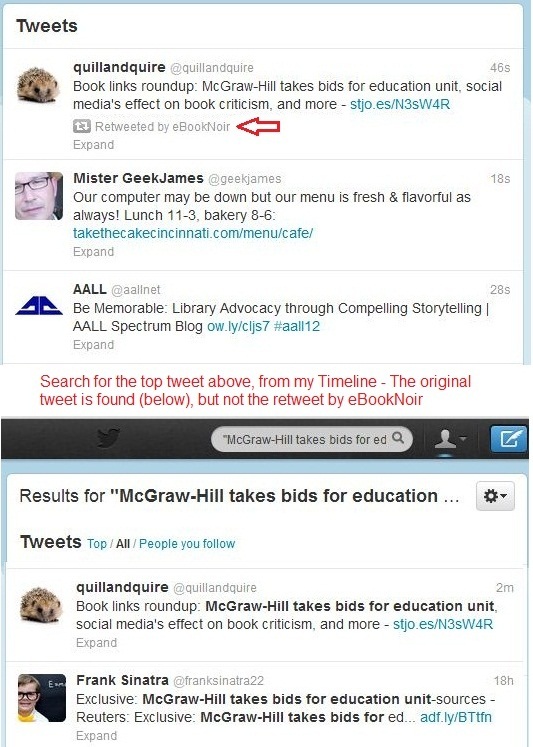 The 140-character limit on Tweets imposes a strict discipline, which requires constant consideration of “What’s important to include?” – Is it more important to give full credit to the writer of a tweet, or author of an article being linked, or is it more important to include a comment or a good quote from the article being tweeted that will draw traffic? This all makes me think how far the fluid process of tweeting is from library book cataloging (that I experienced briefly in my early career), in which the catalog card is created from the title-page of the book according to strict rules. The only strict rule in Twitter is the 140-character limit — Within that, the canvas is empty, open to anything! Posted in PicsYes, Twitter, Twitter Tips, Uncategorized. Remember those heady early days when we thought we were going to catalog the web? … Almost every library felt the responsibility to stuff its website with long and often elaborately annotated lists of web resources for just about everything. Libraries love links so much that most [library websites] look like spam link farms, designed to trick Google. Every other successful website on the planet gave that up in the late ’90s, but not libraries. We librarians like to see a big list of resources because it makes us seem more relevant. As Reidsma has discussed in other works, the problem with the prevalence of link lists on library websites is that users ignore them, and don’t find the really important things on the website … or they just go to Google. 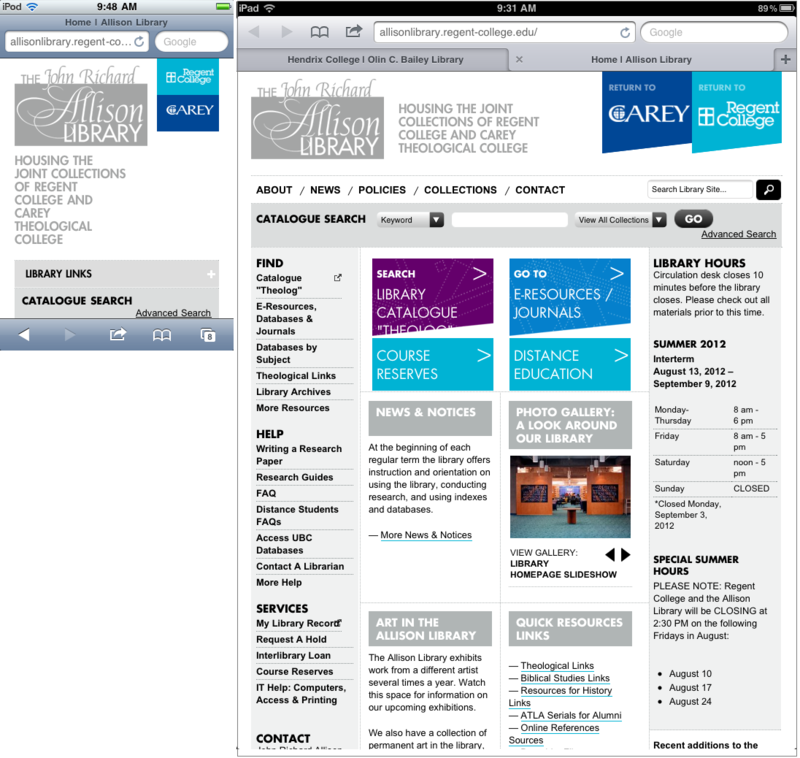 Why do users find library lists so unappealing? Neither of the commentators quoted above, nor anyone else that I’ve seen, has written about it, but the obvious answer, I think, may be … Alphabetical Order — Invariably lists of links on library sites are alphabetical — In the days of PageRank, how boring! PageRank is one of those ideas that seem obvious after the fact. But the business of Internet search, young as it was, had fallen into some rigid orthodoxies. … People naturally thought of existing technologies for organizing the world’s information, and these were found in encyclopedias and dictionaries. They could see that alphabetical order was about to become less important, but they were slow to appreciate how dynamic and ungraspable their target, the Internet, really was. With this great new invention of PageRank, people soon came to assume that any list of resources worth looking at would, of course, have the best links at the top of the list. If they encountered an alphabetical list, their eyes would glass over. So, with most long link-lists on library sites being in alphabetic order, is it any wonder that they’re not very popular with users? So what can libraries do? As Reidsma has been saying recently, we need to look at our websites like our users do, and change them to fit users’ needs — He says from his work with users surveys that this means greatly simplifying library websites. Link lists should be short, with someone’s idea of the “best” links at the top. As I’ve learned with my work on Hardin MD, no matter how long the list of links is, only the top 2-3 will get many clicks. The emphasis on simplifying our websites, of course, fits very well with the mobile revolution. The small screens of mobile devices beg for small, simple web pages, and trimming our lists is a great place to start. Posted in Google, Libraries, Mobile, PicsNo, Uncategorized. Matthew Reidsma gave a presentation recently with the provocative title Your Library Website Stinks and it’s Your Fault [abstract]. 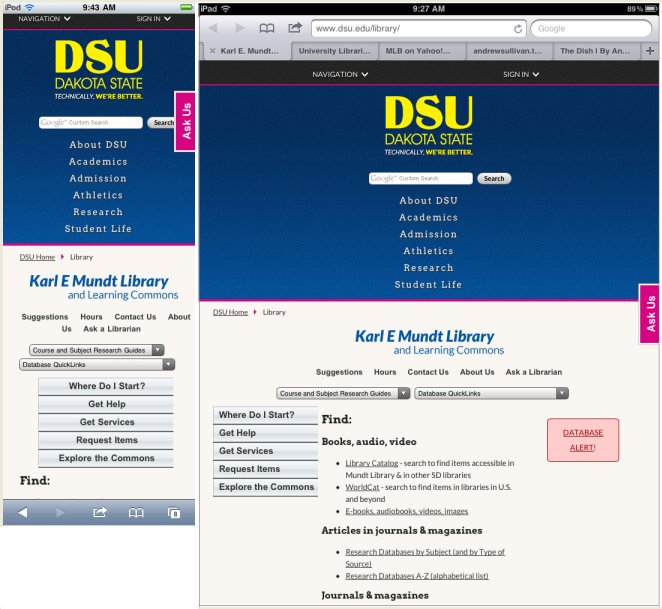 In combination with that, he also wrote an article on the same theme, Bad Library Websites are just a Symptom. I’ll mention briefly some of the points that he made, but the main idea I want to stress here is that Reidsma has an answer to the problems he details with library websites, namely Responsive Design. 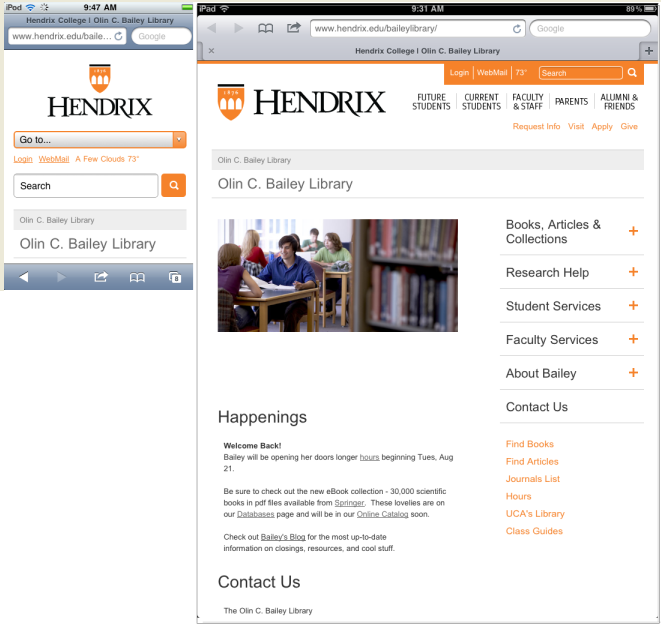 Reidsma’s predominant theme is that the way to build good websites, including library websites, is to listen to our users. 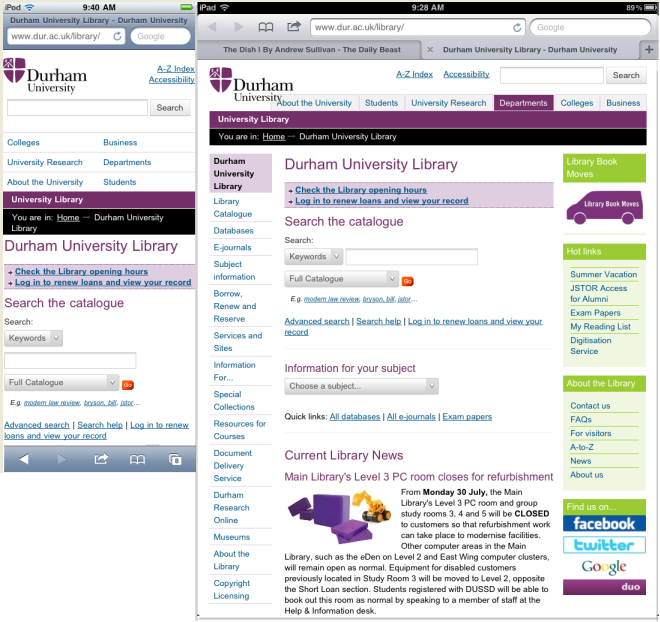 Users think differently from us, so we need to spend a lot of time doing usability studies of our web pages. From usability studies at his library, Reidsma says that the overriding lesson he’s learned is that users want simple web pages — A big, fat, Google-like search box, with just a few good links. 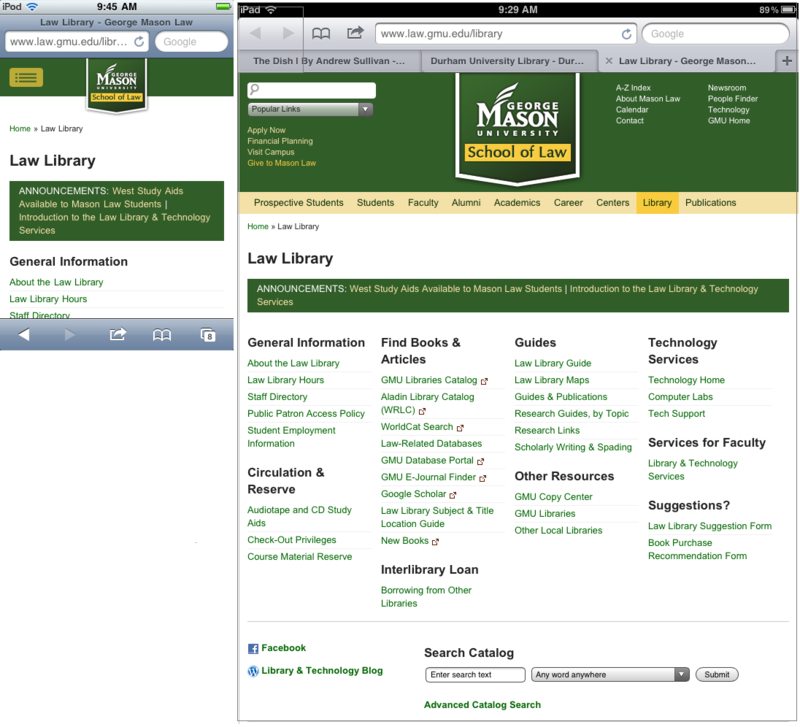 Serendipitously, about the same time I came across Reidsma’s ideas on library websites, I was reading about Responsive Web Design (RWD), a recently innovated way to make web pages so that they look good on any size screen, from smartphone to desktop. This requires that the basic page contents be fairly simple, and goes along with the “mobile first” idea that pages should be designed first for small-screen viewing. 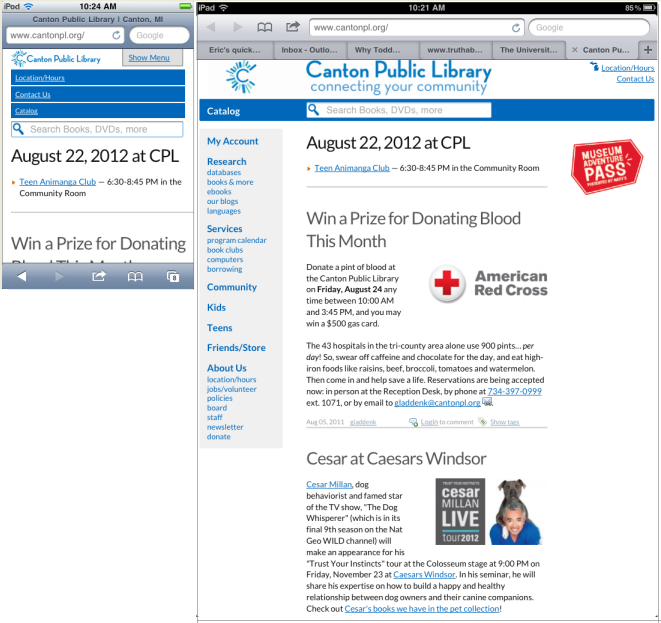 I was becoming interested in RWD especially because our library is working on implementing it. So I was looking around to see if any other libraries were doing it, and, low and behold, the only other one I found was Reidsma’s library (actually a sub-section of it). Interestingly (and surprisingly), Reidsma has not written anything about RWD, but he will talking about it at a work shop on it at ALA-LITA this summer. It fits in well with his ideas about library website design, and it will be interesting to see how he combines the ideas in his session in Anaheim. Wroblewski thinks the hard choices required to prune all but the most important features make for stronger sites. And, indeed, after they go through the mobile development process, companies often find that their desktop site looks busy, clunky and old by comparison. 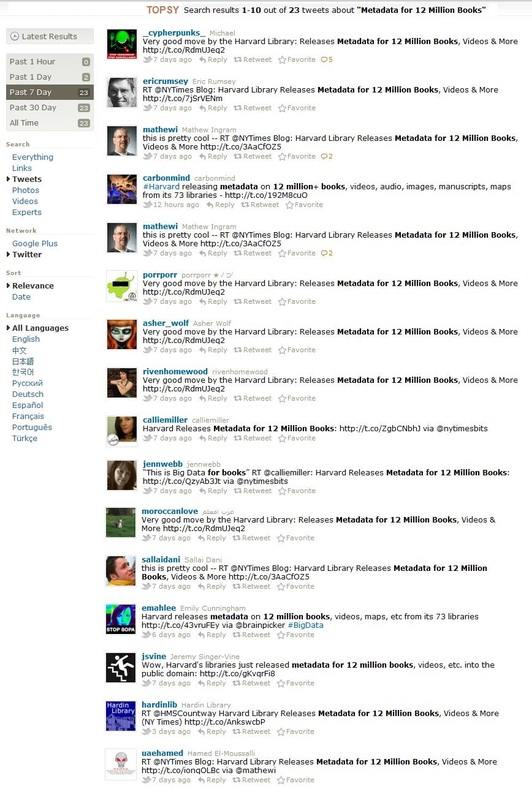 What works for the dotcom companies of Wroblewski’s world can also work to the benefit of libraries. Actually, libraries have the great advantage over dotcoms that we don’t have to worry about where to put the ads squeezed out by mobile-minimalist design! Posted in Libraries, Mobile First Design, PicsNo, Responsive Design, Uncategorized. During this time, designer Luke Wroblewski (@lukew) proposed a somewhat different approach, that he called Mobile First. This is based on the idea that the best way to make web pages is to design them first for their appearance on mobile devices, and then to take into account the large-screen appearance secondarily. 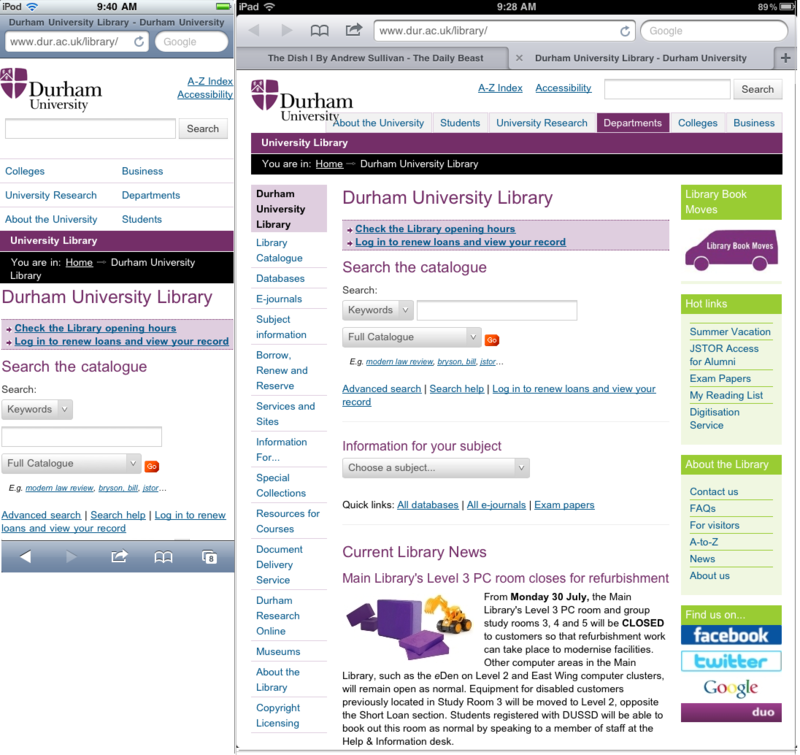 This approach has the great advantage that it eliminates having to maintain separate pages for small and large screens. While there was a variety of tablet-like devices with screen sizes between smartphone and desktop before the iPad launched, they were never very popular. With the overwhelming success of the iPad, though, it quickly became clear that tablets of various sizes were here to stay (shown nicely in designer Brad Frost’s graphic below). 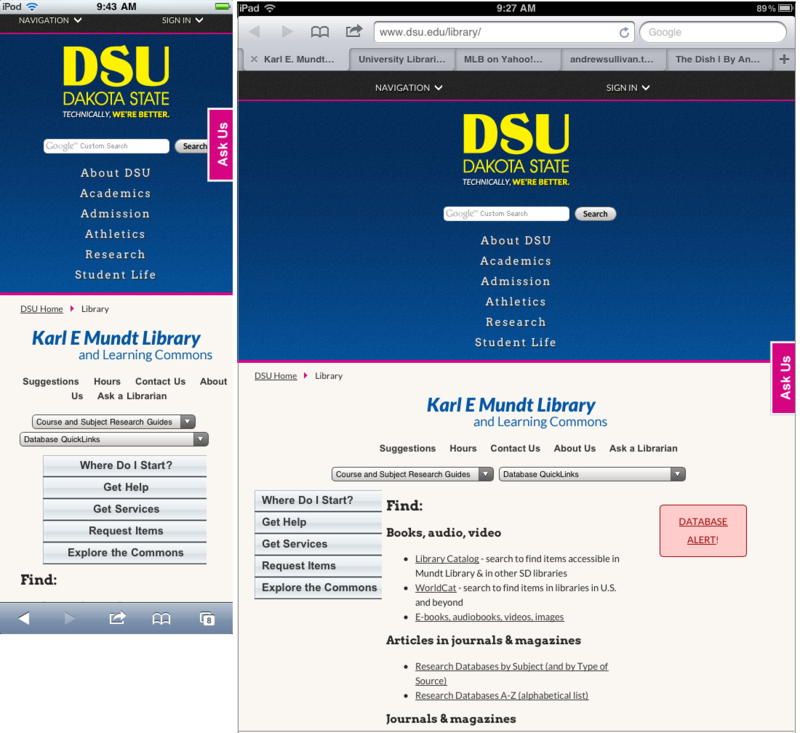 Before the iPad, the idea of having separate mdot-smartphone and desktop web pages was considered difficult but possible. When it became clear, though, that tablets of many sizes would proliferate, maintaining separate pages for every size was obviously impractical. What was needed, thoughtful developers realized, is a way to code pages so that they look good on any size screen. So, soon after the iPad launched in April, 2010, Ethan Marcotte (@beep) — building on Wroblewski’s Mobile First idea — launched what he named Responsive Web Design (shortened to Responsive Design or RWD). This uses sophisticated coding (CSS media queries and fluid grids) to build pages that “flow” to look good on any size screen. The RWD idea spread quickly with developers, who implemented it on their own sites and on smaller dotcom sites. 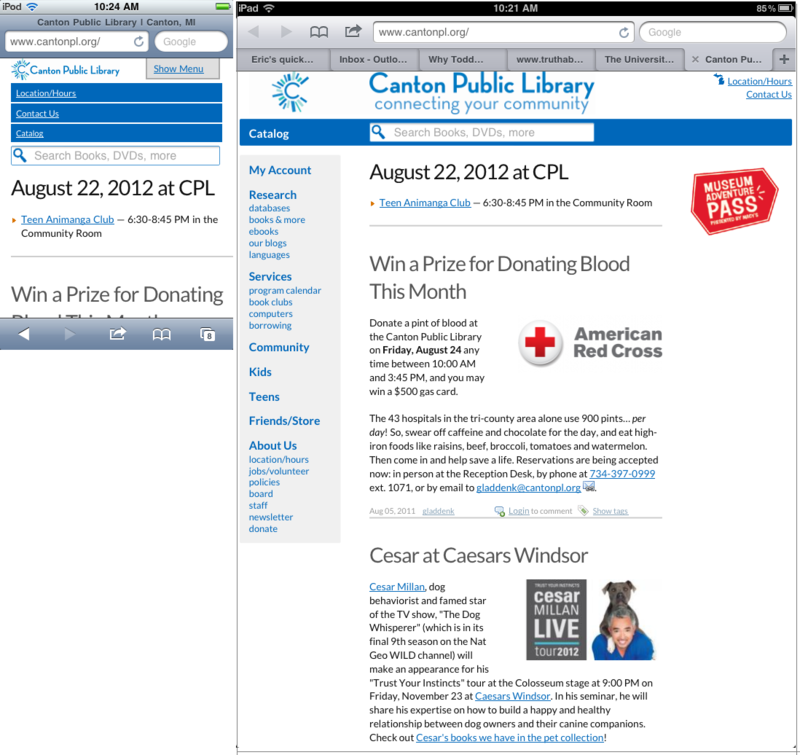 In 2011, high profile sites began to launch RWD versions, most notably The Boston Globe and BarackObama.com. On a desktop/laptop screen, a nice thing about looking at RWD sites is that it’s easy to see how they look on smaller screens — Just narrow the browser window, and the RWD site changes to the appearance it has on smaller screens – Try it out on a sample of RWD sites that have appeared in the last year: BBC, MinnPost, Center for Investigative Reporting, ProPublica, Univ Notre Dame, Arizona State U Online, A-W architecture, Jason Weaver (a small, exemplary developer site). Libraries have been slow to adopt RWD so far. 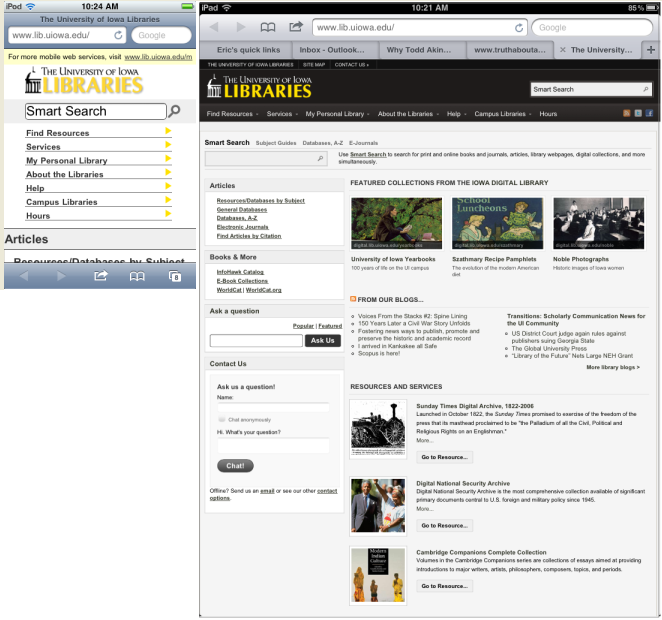 Our library system at Univ of Iowa has started with it (which is how I got interested) – We have it on the main University Libraries site and on the Hardin Library site. The only other RWD library I’ve found is Grand Valley State Univ (Michigan), which has implemented it on a sub-section of the library site. Posted in iPad, Mobile First Design, PicsYes, Responsive Design, Uncategorized. With many rave reviews when it came out, Flipboard was chosen by Apple as the best iPad app of 2010, and selected by Time magazine as one of the top 50 inventions of 2010 (along with the iPad). Much of the commentary on Flipboard has focused on its transformative effect on Twitter, and that’s what I’ll focus on in this article. The shrunken screen shot at left has my tweets as they appear in Twitter on top, and the corresponding tweets in Flipboard below (click image for large view). The headlines and the text in the Flipboard entries are from the articles themselves — When one of these is clicked, the whole article appears. 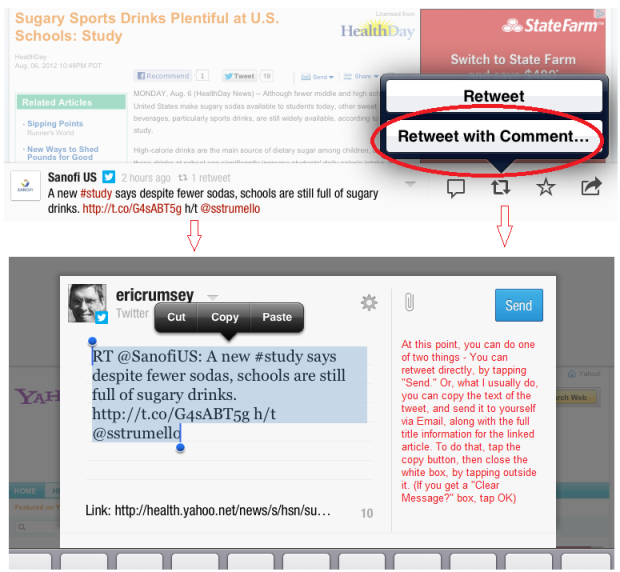 The tweet also appears at the bottom of the screen, from where it can be retweeted or replied to. I should mention that most of my tweets contain links, as do all the ones in the screenshot, so this doesn’t show Flipboard’s filtering out of non-linking tweets, which, as the reviewers above emphasize, is one of its best features. 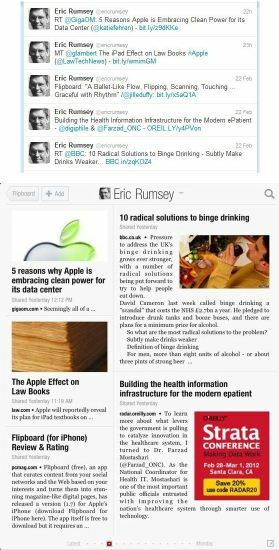 Before Flipboard, Twitter Lists never really took off — With Twitter, exploring a new List can be fairly imposing, especially because of the raw, unfiltered chatty tweets of many unknown Twitter users. In Flipboard, though, Twitter Lists come into their own — By turning the raw Twitter feed into a graphic, filtered screen of newsworthy articles, Flipboard makes it much faster to explore a new List to see if it’s worth reading. The screenshot and brief description above give only a rough idea of how transforming Flipboard is. It’s hard to convey in words what makes it so appealing — I suspect it’s that it does such a good job of capturing the touchy-feely, animated potential of the iPad. Without a doubt, this makes it fun to use, but it also makes it a much faster and more efficient way to browse through tweets than can be done in Twitter and other non-graphic clients. One of the specific parts of Flipboard that shines is the smooth, fluid “sliding panel” transition that pulls the reader from the initial, abbreviated view of an article into the full view. The sliding panels metaphor is more fully implemented in the Twitter iPad app, but I like the fluid sliding effect in Flipboard better. Is this enough to convey the idea? — Get your hands on an iPad, and let your fingers experience Flipboard! I truly believe that anyone who finds … Twitter to be dull, or unusable, will find [it] to be 100% more engaging on Flipboard. This is the next step. Steve Jobs felt similarly — As reported by Robert Scoble, he wasn’t a big fan of Twitter, but he loved Flipboard. I shy away from the term “killer app,” but it’s hard to avoid with Flipboard — I’ve had an iPad for three months. I thought when I got it that I’d spend much time exploring all the great apps I’ve long been reading about. But instead, I’ve spent most of my iPad time on (free!) Flipboard – By itself, it justifies the price of the iPad — Is that a killer app? About the title of this article — As I was writing, and thinking about a title, I tweeted this phrase I came across in another article: “FlipBoard & iPad were a Match Made in Heaven.” I was flattered when Flipboard CEO and Co-inventor Mike McCue (@mmccue) favorited the tweet — Aha! — There was my title! Posted in Flipboard, iPad, PicsYes, Twitter, Uncategorized. Eric Rumsey is a librarian and web developer at the Hardin Library for the Health Sciences, University of Iowa. He is the founder and manager of the Hardin MD site. © 2019 Seeing the Picture, all rights reserved.